Please don’t forget to send in your marked ballot before Friday the 8th of February if you are not coming to the February 9th meeting. If you have any nominations, write them in. Hope to see you at our meeting and stay for our chili lunch. 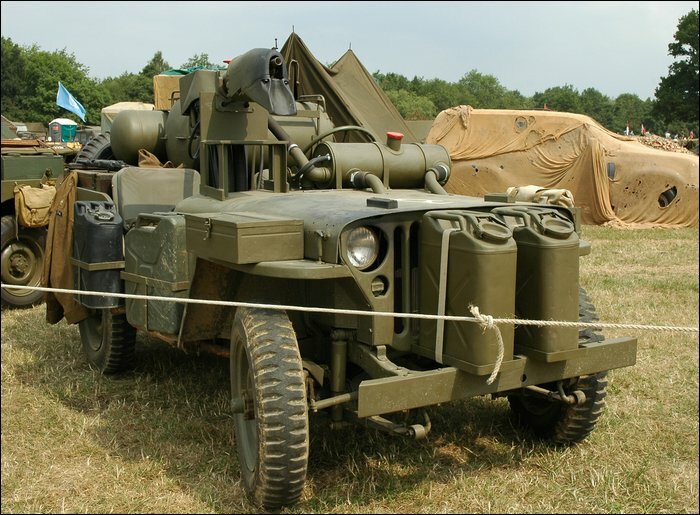 Can anybody identify this vehicle? Brenda, Diane and Judy are bringing chili and Dave Billings is bringing the bowls and cups, but we still need: crackers and cheese, fruit bowl, and drinks. Please let Judy know if you can provide one of these. Mark your calendar. The Topeka Chapter of the MVPA “Rolling Thunder” has started planning the Public Battle at Forbes Field on Saturday, June 7, 2008. The plan is similar to last year with battles at 10:00 am and 2:00 pm. There will be an area for displays. Camping is allowed on Friday night. Dinner will be provided by the MVPA. We are working on getting the battlefield expanded to add some flavor to the same old, same old. I have heard the Newton battle is not happening this year. So bring yourself or your unit to Topeka. At our next meeting on February 9th, we are having a chili lunch after our election of officers. Please send Judy an email to sign up for one of these items. Thanks! Hope to see you all there! NOTE: The ballot must be placed in a sealed envelope marked ‘BALLOT’ and placed in another envelope for mailing. This is to ensure that the votes are not read or revealed until the next club meeting. Thank you for your cooperation.